Bruno Ganz stars as Adolf Hitler in Downfall, showing at the Wheeler Opera House this week. Toward the end of “Downfall,” an account of the final days of Germany’s Third Reich, Hitler’s stenographer Traudl Junge comes face to face with a Russian soldier, a member of the Russian force about to capture Berlin. The camera zooms in on the silent, unnamed soldier’s face. Part of the effect is dramatic and emotional: Junge, trying to evade being taken prisoner, has been told to keep her head down; being a woman, she may slip unnoticed past the Russians. But whether director Oliver Hirschbiegel intended it or not, the moment confirms the essence of “Downfall.” That camera shot is the first in the film that offers a clear view of anything other than a German. Apart from the advancing Russian army, which is seen largely at a distance, fuzzy, in battle, the film is populated entirely by the German people: the Third Reich members in their mazelike bunker; soldiers outside fighting fruitlessly to hold Berlin; a band of zealous children acting like soldiers; the occasional civilian clinging to life amidst the explosions and gunfire. What isn’t shown are the more typical images from that time. There are no concentration camp victims or survivors, no victorious troops raising flags on the former Nazi turf.”Downfall” is emphatically about the German view of the last days of World War II. Judging from my own gasping reaction at seeing Hitler portrayed as a human being, rather than the standard face of unrivaled evil, it is a perspective from which we don’t often look. That perspective does not make “Downfall,” a German production that earned an Academy Award nomination for best foreign-language film, sympathetic to Hitler and his associates. 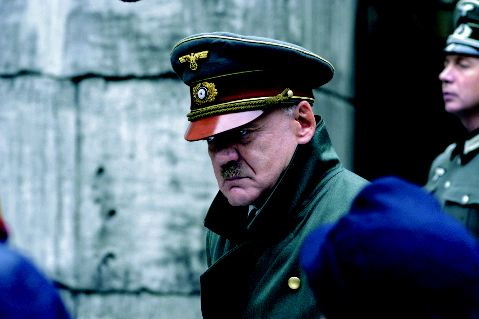 Hitler, portrayed with authority by Bruno Ganz, is hardly depicted as a heroic character. 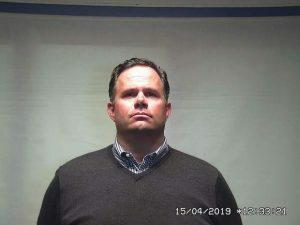 Almost never seen outside of that lifeless gray-on-gray bunker, he is paranoid and barely in control of his faculties. One hand constantly twitching behind his back, Hitler vacillates between proclamations of imminent victory and outrage over the disloyalty that is dragging Germany to defeat. He orders the movement of army divisions that have already been wiped out. Yes, “Downfall” shows Hitler as human – but representative of humanity at its worst.Setting aside the typical grand, good-versus-evil moral issues, “Downfall” raises and thoroughly explores another issue: How and why do people cling to a failing philosophy? Where do they turn when that way of thinking proves wrong? What becomes of their relationship to the proponents of the philosophy? (The idea that the tenets of National Socialism were fundamentally flawed is a strong subtext of “Downfall.” How else to explain the defeat of Nazism, which preached the superiority of the German race? )”Downfall” focuses on a group of characters in the bunker and their responses to the impending fall of Nazism. At one end are the loyalists Joseph and Magda Goebbels (Ulrich Matthes and Corinna Harfouch), whose clutch of the Nazi Party is taken to a sickening extreme. At the other end is Dr. Schenck, the sanest of the lot, whose desire to preserve life stems not only from his medical background but from his more rational views on the world. Off in her own corner of unreality is Eva Braun (Juliane Köhler), who laughs and throws parties as the bunker shakes from the bombs outside.